The average size of a Costco is 143,000 square feet of mostly warehouse. Costco is meant to be appealing to businesses and private consumers by providing a range of products that will attract both. Most of the merchandise is national brands, but Costco also offers private label products, as well. Merchandise usually comes in multi-pack, cartons, or cases. Buying in bulk is the name of the game here. High volume sales save members on the cost of groceries and household products. The selection is limited and the average Costco only carries 3,700 to 4,500 active SKUs (stock keeping units, i.e., number codes). This is as opposed to a regular supermarket that normally carries 45,000 or more SKUs. Costco operates 413 clubs in the United States, including Alaska, Hawaii and Puerto Rico. Costco (NASDAQ: Costco) has a 5.3% share of the grocery market. Total Costco sales in their fiscal year ending August 2009 (most recent data available), total sales reached $69.9 billion. $39.9 of that (or 67%) was for sales related to food purchases. In July 2011 it was considered the largest retailer in the U.S. and seventh in the world. Costco was started in Kirkland, Washington, and now has stores in the U.K., Australia, Canada, Taiwan, Mexico, Japan, and South Korea. Costco is the first company to grow from zero in sales to $3 billion in less than six years. With the fiscal year ending August 2009, total sales equaled $72.42 billion with a $1.09 billion net profit. In addition, The American Customer Satisfaction Index rated Costco as number one among specialty stores. 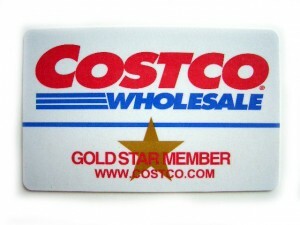 Costco requires a membership that allows members to bring two guests. However, only the member is allowed to pay for the purchases. The organization limits its markup to 15%. Merchandise is displayed on industrial steel shelving, rather than fancy displays like those at regular supermarkets. The types of grocery they carry are canned goods, condiments, frozen foods, cereal, beverages, paper products (including disposable diapers) snacks, candy and fresh produce. They also include a butcher/meat section and a bakery. In addition, Costco also offers wine, home appliances, jewelry, furniture, electronics, books, clothing and many other products. They also offer the services of a pharmacy, gas stations (some locations), optometrists, hearing aid center, and photo processing. Many products are available with the Costco private label, Kirkland Signature. The name derives from the location of the original Costco in Kirkland, Washington. Products available as private label include bottled water, snacks and paper products. Most stores include a food court that offers reasonable prices for sandwiches, soft drinks, salads, hot dogs, pizza, frozen yogurt and smoothies. I would like to know if my CostCo membership has expired?